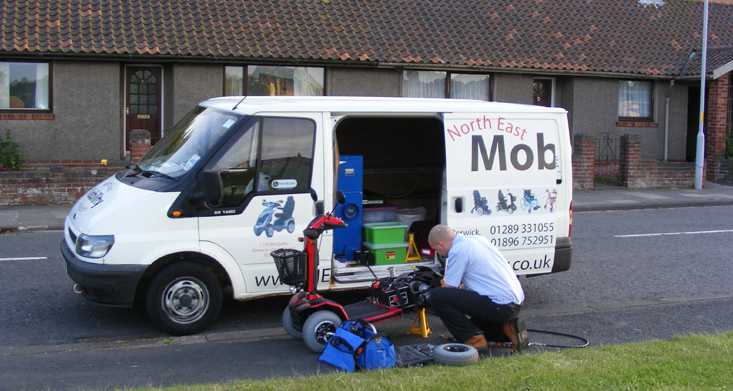 At North East Mobility Solutions, we have fully trained service engineers to carry out Service and Repairs on all makes and models of Mobility equipment, Mobility Scooters, Stairlifts and Mobility Aids. Our vans are fully kitted out with a parts store, tool box and compressor as well as 240v electricity allowing us to carry out the repair or service quickly and efficiently at your specified locations. We can carry out any job from a wheelchair puncture to a full strip down, mobility scooter service or stairlift service at your door. Our service engineers have access to all the latest equipment and technology to carry out their work quickly and efficiently, saving you time and money. If you need to book a service or repair on a mobility scooter, stairlift, wheelchair or any other type of mobility equipment in the North East / Scottish Borders area or just require information on how to look after your mobility product, please contact a member of our team on 08432 903 317 or use the CONTACT US page.